The SP network management port is labeled NET MGT. 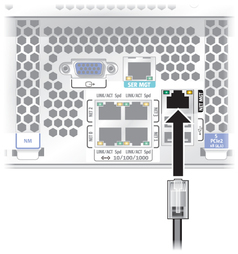 After the initial server configuration, you can connect to the SP over an Ethernet network using this NET MGT port. If your network uses a DHCP server to assign IP addresses, the DHCP server will assign an IP address to this NET MGT port. With this IP address, you can connect to the SP using an SSH connection. If your network does not use DHCP, this NET MGT port will not be accessible until you configure the network settings through the SER MGT port. For instructions, see Assign a Static IP Address to the NET MGT Port. Connect a Category 5 (or better) cable from the NET MGT port to your network switch or hub.